What is Cort-S Injection (Hydrocortisone) used for? 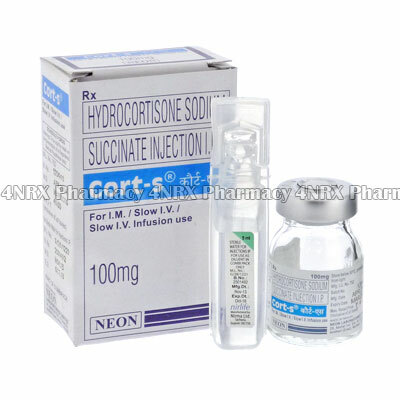 Cort-S Injection (Hydrocortisone) is an injectable corticosteroid used to treat intense inflammatory conditions. The medication blocks the actions of certain enzymes in the body to prevent the swelling, irritation, and pain caused by injury. This action makes it useful for treating severe arthritis, breathing problems, or severe allergic reactions. Your doctor may also prescribe its use for the treatment of other unlisted conditions. How should I use Cort-S Injection (Hydrocortisone)? Cort-S Injection (Hydrocortisone) should always be used according to your doctor`s instructions to get the safest and most effective results from treatment. The correct dosage will be determined by your age, weight, current health, the condition being treated, and the severity of your symptoms. The injection should be performed by your doctor or another fully trained health care professional in a hospital or health clinic. If you are required to perform your own injection, make sure you are fully instructed in the correct procedure to prevent serious health problems. To perform the injection sterilize the needle and injection site, collect the correct amount of medication into the syringe, remove any air by holding it vertically and tapping the syringe while pressing the plunger until liquid emerges, and slowly perform the injection into the muscle. Attend any follow up appointments required by your doctor and ask any questions you have regarding the medication prior to beginning use to ensure the correct administration. What are the side effects of Cort-S Injection (Hydrocortisone)? Serious side effects possibly requiring immediate medical assistance are fever, flu symptoms, sensitive skin, easier bruising, irregular heartbeats, chest pain, difficulty breathing, slow wound healing, joint pain, seizures, blurry vision, darkened urine, discoloured stools, or jaundice. Inform your doctor as soon as you experience any worrying or intense symptoms to make sure the necessary changes are made to your dosage or application frequency to prevent more health problems from occurring. Cort-S Injection (Hydrocortisone) should not be injected directly into tendons, infected joints, or by patients who have a widespread infection. Also disclose if you have a peptic ulcer, a history of tuberculosis, glaucoma, epilepsy, diabetes, hypertension, osteoporosis, muscle disorders, or a history of psychiatric illness caused by other corticosteroids. These conditions may cause unexpected health problems requiring adjustments to your treatment. Strictly use Cort-S Injection (Hydrocortisone) as prescribed and follow all instructions provided by your doctor. Safe, suitable, and optimum dosage can vary and is dependent on the patient`s health and medical history, as well as the condition you are treating. Cort-S Injection (Hydrocortisone) may not be safe or suitable for all patients. Always ensure your doctor is informed if you are pregnant or breastfeeding, using any other type of medication (including non-prescription medicine, vitamins, and supplements), as well as if you have any allergies, other illnesses, or pre-existing medication conditions.